A councillor who collected nearly 1,000 signatures for a petition against housing developments has said it shows the ‘universal hostility’ towards the plans in Rugby’s villages. Cllr Howard Roberts, an independent borough councillor who represents the Dunsmore Ward, fears villages could be swallowed up by the proposed developments in the borough council’s Local Plan. The document sets out how Rugby Borough Council plans to accommodate 12,400 homes over the next 15 years. 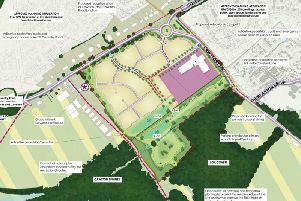 Part of the plan has earmarked Dunchurch for 5,400 housing units at the North-West edge of the village and Stretton on Dunsmore for around 100 housing units. Cllr Roberts said the number of signatures collected from Dunchurch and Stretton on Dunsmore shows the strength of feeling. “It has been clear from the residents I have spoken to that they are extremely sceptical about the council’s projection for required housing growth over the next 15 years,” Cllr Roberts said. “There is genuine worry about how village infrastructure will cope with such an influx of new residents. Underpinning all of the concerns is a palpable fear that this plan will allow Rugby’s sprawl to mean some villages become a linked part of the town. “I will now present this petition to the planning office at Rugby Borough Council. Cllr Roberts added: “If the Conservative group does decide to proceed with this particular plan then I will be using the groundswell of public opposition to lobby the planning inspectorate and Secretary of State to intervene and censor the plan makers.